Babyteeth #2 picks up right where the first issue ended. To recap, in Babyteeth #1 we met Sadie Ritter, a pregnant sixteen year-old living in SLC. Confused and scared, she hides her pregnancy from everyone except her older sister, Heather. When Sadie goes into labor, her contractions register on the Richter scale….literally. With each contraction comes a massive earthquake. When her baby is finally delivered, Sadie names him Clark (after Superman). Others will call him by different names. Among them are The King of Ash, Void-Lord, The Antichrist, and The Final Son. Sadie serves as our guide, telling the story in past tense as we’re seeing it unfold in real time (Babyteeth #1 is set to drop on Clark’s actual birthday). In Babyteeth #2, we get to see Sadie’s little family rally around her, even though she refuses to give up Clark’s daddy. Being a single teen mother is tough enough, and out of nowhere, Clark won’t latch, won’t take a bottle, and won’t sleep. Add in that whole Antichrist thing, breaking open barriers between earthly and demonic planes, unleashing eternal suffering on all mankind, and the assassins already hunting baby Clark down to kill him, and Sadie has her hands full. 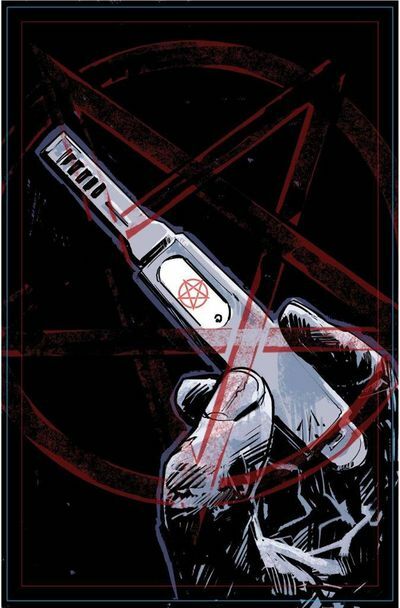 Donny Cates (Redneck, God Country, Ghost Fleet) delivers another brilliant script full of dark humor, terrifying reveals, and tender moments. There’s even a sly nod to Ghost Fleet. Garry Brown (Black Road, John Carter: The End, The Massive) delivers characters that are distinctive and authentic, with a wide range of emotion. Brown’s settings are also on point. From the SLC to a secret board meeting in a bunker, every setting has an idiosyncratic look and feel. I’ve said it before, and I’ll say it again: Everything Donny Cates touches right now is red hot. Don’t miss out! The only way to ensure getting your hands on a first print copy of Babyteeth #1 or Babyteeth #2 is by pre-ordering. Save 20% up front with a pre-order, or pay eBay prices later. Donny Cates (Redneck, God Country, Ghost Fleet) is back at it again. This time, he’s partnered with Garry Brown (Black Road, John Carter: The End) to bring us Babyteeth #1, a story of the not-so-immaculate conception and birth of the Antichrist. Where does this not-so-immaculate conception take place? In Salt Lake City Utah, of all places. Sadie Ritter is a pretty normal teen, except for one thing. She’s pregnant, and her baby is the Antichrist. While you might expect this story to unfold in the exact opposite manner as the Nativity, it’s actually pretty innocent. That is, if you can get past the mystery of the baby’s father and the massive earthquakes that coincide with Sadie’s contractions. There’s also the matter of the destruction of the barriers between earthly and demonic planes. Garry Brown’s art style is well known for beautiful brutality. The depth of detail Brown provides in the landscape and scenery makes the modern day setting of Salt Lake City jump off the page. The expressive detail he lends to the characters’ faces sells Cates’ script beautifully and helps make Babyteeth a highly emotional read. Everything Donny Cates is writing these days is pure gold. With God Country currently in its fourth printing, Redneck already going back to press for it’s second run, and the brilliant showing here by Cates and Brown, Babyteeth #1 will undoubtedly fly off the shelves as well. MAKE SURE TO CHECK OUT THE REST OF BABYTEETH!